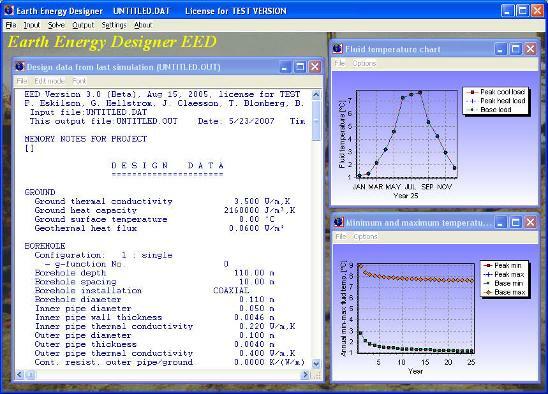 Earth Energy Design (EED) is a PC-program for borehole heat exchanger design. Its easy of use, short learning curve, quick calculation times and inherent databases make EED a useful tool in everyday engineering work for design of ground source heat pump system (GSHP) and borehole thermal storage. In very large and complex tasks EED allows for retrieving the approximate required size and layout before initiating more detailed analyses. Even for very small plants EED values the effort to do a calculation instead of using rules of thumb is worthwhile.